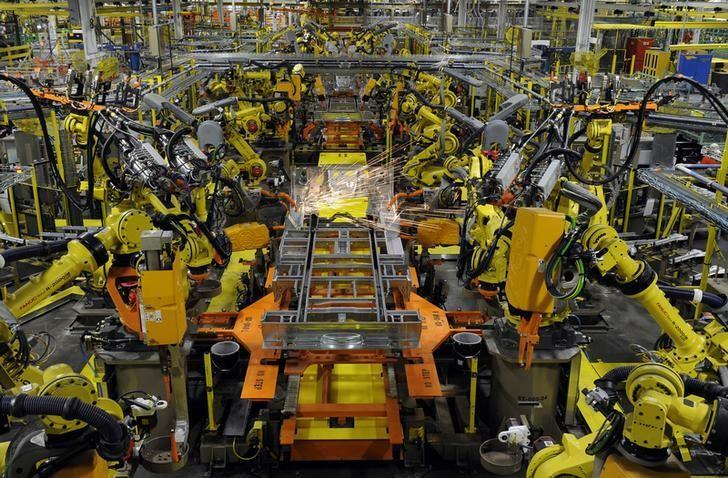 NEW YORK (Reuters) - Growth in the U.S. manufacturing sector eased in June, hitting its slowest pace since October 2013, according to an industry report released on Wednesday. Financial data firm Markit said its final U.S. Manufacturing Purchasing Managers' Index declined to 53.6 in June, its lowest since October 2013, from 54.0 in May. The June reading was up slightly from a preliminary reading of 53.4. The index's employment component rose to 55.5 in June, the highest level since September 2014, from 54.6 in May. Output slowed in June to 53.9, the lowest level since January 2014, from 55.2 the month before. "Purchasing managers are reporting the slowest rate of manufacturing expansion for over a year and a half, suggesting that the economy is slowing again," said Chris Williamson, chief economist at Markit. "The slowdown is largely linked to a third consecutive monthly fall in exports, in turn attributed by many companies to the strong dollar undermining international competitiveness." The manufacturing sector Purchasing Managers Index is compiled by information services company Markit.